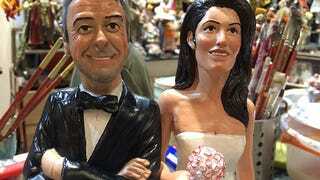 Newlyweds George Clooney and Amal Alamuddin stautes on display in a shop in Naples. George Clooney and his fiancee Amal Alamuddin are expected to get married this weekend in Venice, one of the worlds most romantic settings. Naples, Italy - Friday September 26, 2014. NORTH AMERICAN USE ONLY Photograph: © Kika Press, PacificCoastNews. Images via Pacific Coast News.